In the mail today I received the catalogue for the 17th Bienal de Cerveira which is currently running as a hybrid first life and virtual world exhibition. I was surprised at how huge it is, 350 pages and full colour. The Bienal is made up of artists from all over the world and many of the images show high quality traditional works in a variety of media. So it was nice to see a large segment of the book devoted to virtual artists specifically those working in Second Life. I have included the text below, there are also numerous pages of full colour images from each artist. The origin of this Biennial work is inscribed in the dynamic developed for avatars in the metaverso platform of Second Life. In this context, two types recognizable environments are emphasized: the environment and the work – as a virtual object. In the first case we have the artists’ proposals presented in the avatar Moya and Bryn Oh recreating their virtual autonomous spaces based on a fictional rhetoric. The first, buoyed by a growing complexity, submits the visitor avatar to a kind of second immersion (if we consider the platform of the Second Life immersive in itself) in a prefigured world created to generate a sensory- intensive experience that is acknowledged and activated by the avatar. If we deepen our level of attention, we can recognize in the virtual projects designed by the two artists as a spatial strategy of the creative process, unexpected reencounter with the concept of Merzbau proposed by Kurt Schwitters (/). It is not only a constructive development of forms but the fiction of space in a constant state of becoming. In the case of the universe proposed by the artist Patrick Moya with his Museu Moya, this dynamic creative flux expands to an increased reality in the sense that it hosts the works made in a virtual and automatic world. This dynamic proceeds in the direction of a kind of liquid flux that merges two converging realities. It is not just two parallel realities, but one only one that flows between the atom and the bit. 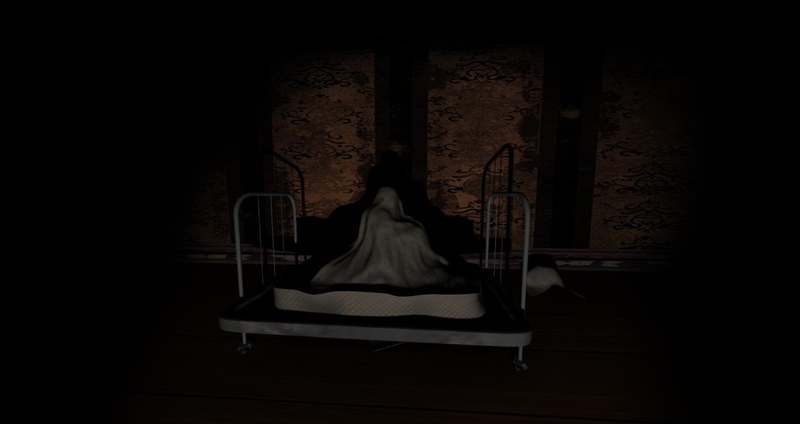 In the virtual work presented by the artist Bryn Oh (CA) we can find a distinct dynamic narrative in which the artist explores the sensorial sense of the avatar by presenting singular experiences to the viewer according to the path and environments created. Bryn Oh, besides exploring the mimetic representation of reality in terms of the rendering of forms (textures), also develops representationally complex spaces in which each level of access is like a dive into a fictional universe invoking the magical and fantasy universes explored extensively and recurrently in literary production. the virtual modulation. Both artists enhance the immersive aspect of the work by a mimetic process of intimate access which is valued and recurrent in the world of illustration. It’s about inhabiting the image. In the remaining works, we acknowledge the dynamic achieved with different levels of experimentation through tools accessible in the metaverso such as the interaction with the work – avatar, valorization of movements of animated forms and an efficient synchronization between form, color and space. In this exhibition of metaverso, we detach the concepts of impermanence and fluidity as a media and metaphor of the constructed world in zero-graviy. 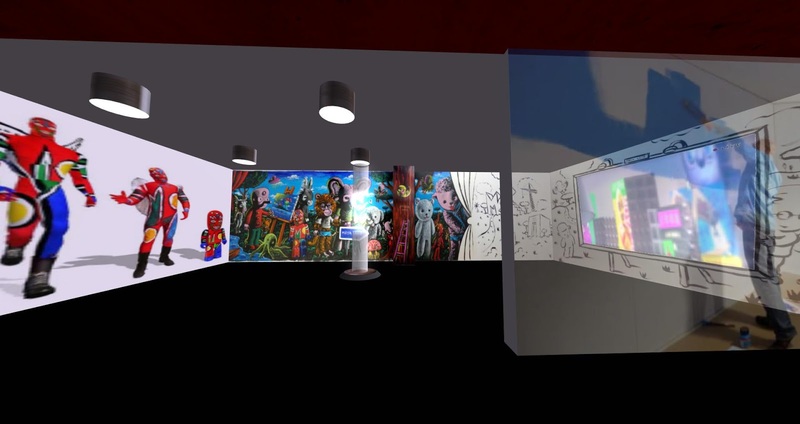 We highlight in Bienal Virtual at the SIM Angel Isles, designed by the French architect Pierre-Divier Fouqué, the contributions of Julio Juste Ocaña, aka Holala Alter (ES), Elif Ayiter, aka Alpha Auer (TR), Osferatus Haven (FR) e Maya Paris (UK) e CEElesteSerra (PT).Also, in this space we have machinimas coordinated by André Lopes (PT) showing works on film made completely in virtual spaces which explore and enhance the potential of the narratives. In this section we can see the artworks of Tutsy NavArAthnA (GR), Bryn Oh (CA), Toxic Menges, Traceshops and Spyvspyaeon (PT). 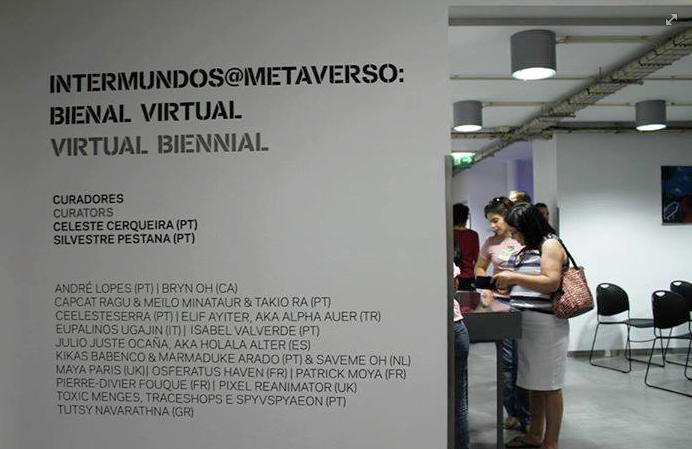 At the same time, thematic conversations by Paula Justiça about virtual art are also in the program beside the performative interventions by the digital performer Pixel Reanimator (UK), with the project Machinic- Babenco and MArmaduke Arado (PT) and Isabel Vilaverde (PT). All are artist interventions referring to the interactive potential available in the metaverso areas. We should also refer the recording of performative actions that take place in the virtual spaces of conceptual self-representation. These visual recordings, in addition to their historic value, also work as corridors of access between the disconnect of reality and the virtual world. In other news, which is actually not news at all, yesterday I went to a conservation area outside Toronto called Silver Creek and took a picture of this frog. 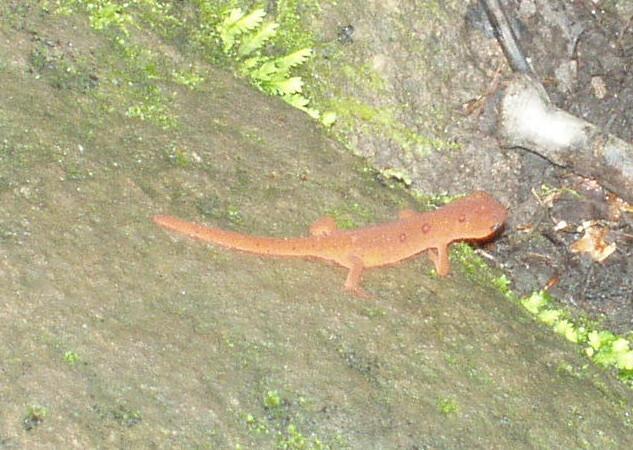 I also found an Eastern Newt! I have only ever seen Newts a few times before this and was delighted to find that they are quite content to sit on your hand. My picture is pretty crappy so I have included a better one which I found on the internet. I also came across a Millipede as big as my finger, I have never seen one even close to that size before. Sadly, for some reason I forgot to take a picture of him. "Sedition is a revolutionary new way to collect art by the world's leading contemporary artists in digital format. Experience a whole new world of art and collecting."
. My work will have an edition of just 100 to be purchased. They represent some notable artists ranging from Yoko Ono to Damien Hirst. They will be of a very high resolution but it is more about supporting the concept I think. This could perhaps be an important step for some artists, and to be honest it is much more accessible than a painting on a wall if the future has everyone with a device of some sort that keeps the digital artwork on person by smartphone, tablet or whatever is to come. You can purchase the work of mine they selected by going to this link http://www.seditionart.com/bryn-oh/juniper-1. Sadly their watermark covers the poem at the bottom of the machinima... which I have told them is an essential part of the work.. but as of yet are unable to move the text that covers it. Grrr. You can see the lower rez version below. From now until September 14 is a major exhibition of virtual work by Second Life artists for the 17th Bienal de Cerveira, as organized by the Cerveira Biennial Foundation in Portugal. There are works by Alpha Auer, Bryn Oh, CEELeste Serra, Eupalinos Ugajin, Holala Alter, Kikas Babenko & Marmaduke Arado, Maya Paris, meilo Minotaur & CapCat Ragu, Osederatus Haven and Patrick Moya. Art: Crisis and transformation will be the subject of debate and reflection of the oldest art biennial of the country, under the artistic direction of Augusto Canedo. The Biennial of Cerveira, which will celebrate in its 17th edition, 35 years, keeps structured according to the model that characterized along a route which started in 1978. Thus, the event will include an International Competition, an Honoured Artist, Curatorial Projects, Guest Artists, Performances, Artist Residencies, Workshops and Children’s Ateliers, Debates and Conferences, Guided Tours to exhibitions and Concerts. The Biennial of Cerveira, directed to the promotion of contemporary art, is an event supported by a national and international renown and reputation, combining the art in its various expressions to a territorial space characterized by its quality of life. In its 16th edition, the Biennial of Cerveira received more than 100 thousand visitors. One of the virtual regions they are exhibiting is my build Imogen and the Pigeons on Immersiva. If you come across an avatar by the name of MrBienalCerveira feel free to stand in front of him and do odd gestures and dances for the amusement of those within the Museum. Also they have a full region where the main group of artists are exhibited and there I have a small segment of Virginia Alone exhibited. 17th Bienal de Cerveira website. I gave permission for the organizers to use Immersiva in the exhibition well before Imogen and the pigeons was installed, and it brings up an interesting issue in regards to introducing a novice to virtual artwork. I am quite flattered to have had Immersiva exhibited at the event and being this years invited artist along with Patrick Moya, but wow, I can't think of a less new user friendly creation to show people. Imogen and the pigeons is pretty much built for long time followers of my work who tend to be savvy virtual world users. New users do figure it out as well, but often they are helped along by someone or are already well versed in 3D navigation and ideas. There really is little chance of someone sitting down to a computer at the museum and figuring out how Imogen works then following the entire story to its completion. They will appreciate the 3D environment on the ground level along with the novelty of walking in a 3D space, but they likely will never realize the layering of the work itself. This is not necessarily a bad thing as they may get intrigued enough to install SL then explore at home, but it brings up an interesting discussion point on to what degree of difficulty should a new user be introduced to. There are complex artworks in SL that new users may not comprehend, as well as simple traditional RL inspired works (such as a sculpture of Michelangelos David) that they will recognize as a finished work, but may not be overly impressed at its uniqueness within a virtual environment. I don't have the answers as I am just thinking out loud, but as virtual art advances and perhaps becomes more complex will it distance itself and create that mythical walled garden that some believe exists between real life and the virtual environment? I expect in the future there will be an easier transition between the two as technology evolves, but for now it is an interesting conundrum. This exhibit has a nice range of art works with the always fun performance pieces by Kikas and Marmaduke, the interactive and fun oddness of Maya Paris. Eupalinos almost surreal Dada work to Alpha Auer's great colour, composition and design work. Lots of variety for visitors to find at least one which they can associate with. difficulties I mentioned in presentation, yet deciding to accept the challenge regardless. I have spoken to curators in the past from other events who have crumpled at the thought of these difficulties, deciding instead to pursue easier routes to a much less socially relevant exhibit. I really respect curators such as those from the Bienal de Cerveira who really look at the artistic environment of our world and see things of importance affecting art history that some more simplistic curators can not grasp. For this they deserve a great deal of credit. So should you, my virtual world accomplices, have a means to promote their event then please do so as often those who step forward to embrace new ideas need encouragement and the realization that what they are attempting has an audience.